ICERM provides thin clients in all 10th floor offices as well as in the common areas for visitor use. The thin clients run a custom thin version of Linux and provide open access to a web browser, SSH terminal and printing capability. This is the standard desktop screen you will see when you start using one of the IGEL thin clients at ICERM. This guide provides a brief overview of each button on the desktop and their usage. USB Drive - If you connect a USB mass storage/flash device, you can click on this folder icon to launch the file browser and see the files on your drive. Oscar VNC - Opens the VNC client for connecting to CCV's Oscar cluster. Oscar VNC is not available in the 11th floor collaborative space. Terminal - Terminal opens a standard SSH shell which can be used to connect to remote servers. The terminal prompt requires a login. The username is user and the password is icerm. 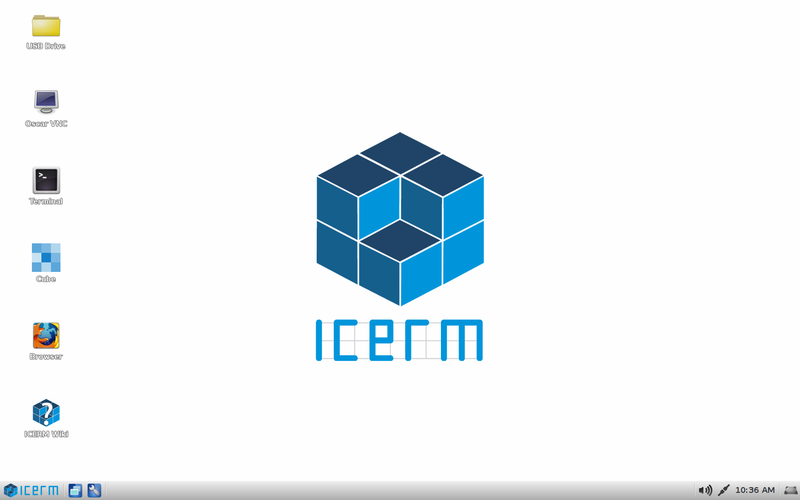 Cube - This icon opens the Firefox browser directly to ICERM's application and profile management system Cube. Browser - Opens a standard Firefox web browser. ICERM Wiki - This icon opens the Firefox browser directly to this wiki. In addition to the file browser, USB storage drives can also be accessed via the terminal (for SSH/SCP file transfer, etc). After launching a Terminal session, enter cd /userhome/media/ to navigate to the USB drive's mount point. Please do not store any files on the thin clients themselves. Since they are thin clients, hard drive space is limited, and any files saved will be accessible to any users of that specific thin client terminal.